Examination and evaluation of blood smears should be done routinely during every Complete Blood Count testing. Microscopic examination provides us with information about the patient’s condition, and is used as a control of automated system results. It is necessary to remember, that the morphological analyzer is just a machine and can make mistakes, especially in case of presence of the abnormal cells in blood, platelet aggregates, or artefacts. Such situations makes the blood smear is one of the most important elements for differential diagnosis. - presence of intracellular and extracellular infectious factors (eg. Parasites in red blood cells, such as Babesia canis, Mycoplasma haemocanis, Mycoplasma haemofelis, neutrophils– Anaplasma phagocytophilum, platelets – Anaplasma platys). 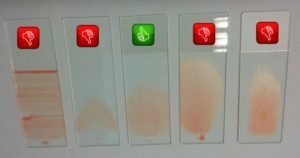 Blood smear examination value is best when compared with medical history, current and previous results of laboratory testing and physical examination. In both situations it is essential to create one layer of intact cells, which enables to perform a thorough examination of blood cells morphology. Smear that is too thin will cause cell deformation and dilaceration. Superimposition of cells in too thick smear will make identification and assessment of cells difficult. To avoid morphologic changes in cells, slide should be done immediately after blood withdrawal or in 30–60 mins when the blood is sampled on EDTA. Slide should be marked with pencil on the matte space and have patient’s details written. It should be stained with dedicated diagnostic stains. - Surface slightly opalescent when put against the light.